Bucket A contains 20 L of water. Bucket B contains 42 L of water. 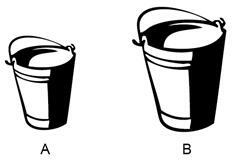 (1) How much more water does Bucket B hold than Bucket A? (2) What’s the total volume of water in the two buckets?